Cloth wiring - is in old house wiring, but it might be fine. 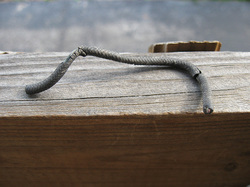 Cloth wiring is in old houses and is the predecessor to modern house wiring (Romex). There are essentially two types. One type has a ground conductor in it. The other does not. The cloth wire without an extra ground wire disallow you from using three prong receptacles, without ground fault protection. There is one thing for sure. These wires are pretty old. They have not been installed in houses for 50+ years. The wiring has a very old rubberized insulation and paper, that is very likely degraded by now.